If you are looking to buy tickets for matches in the Premier League you should buy them directly from Premier League Clubs. You can purchase tickets safely from official Club websites or the ticket office, in person or over the phone. Clubs will also provide details of any authorised ticket partners on their official website. You can visit the Club websites via our Club Profile pages (or click on the Club crests at the top of this page). A "ticket tout" (also known as a "scalper") sells match tickets without authorisation, often at vastly inflated prices. Touts no longer just sell tickets outside the stadium, they also sell them (and aid unauthorised sales by others) on websites and online marketplaces. 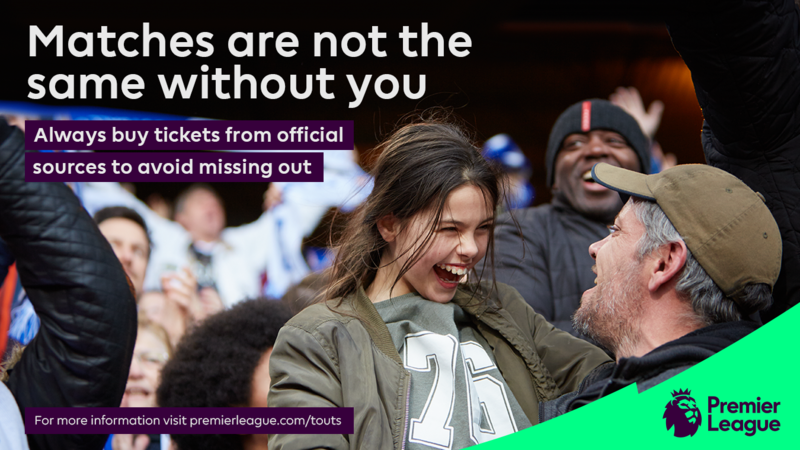 If you buy tickets from an unauthorised source, whether that be an unauthorised website, an online marketplace or a ticket tout outside the ground, you risk not being given entry to the match and losing the money you paid. Tickets sold by touts are likely to become void and do not give you the right to enter the stadium to watch the match, or can you lead to you being removed from the stadium. Other clubs have cancelled thousands of memberships for fraudulent ticketing activity. Please note, if a ticket is packaged with hospitality, travel and/or accommodation that does not mean that the seller is authorised to sell such packages with tickets included. If you are in any doubt, check with the Club before purchasing tickets. Click here for a list of known unauthorised ticket websites. Buying from unauthorised sources can leave real fans out of pocket, or, worse still, outside the stadium on matchday unable to watch their team. We want you to enjoy your match experience in comfort and safety and to ensure that the ticket you buy is genuine. You can guarantee you are obtaining official match tickets by always purchasing directly from Premier League Clubs. In the 2014/15 season, 25,000 purpoted Manchester United tickets with an advertised value of £8m were on sale on unauthorised ticketing websites.